I would like to warmly welcome you to Broadstone First School. We hope that you enjoy the opportunity to gain a brief insight into the varied and exciting learning environment here. We are a values led school. Our values are respect, creativity and independence. Simply put, we ensure that these values are at the centre of all our young learners’ experiences. A certain amount of knowledge is important, however, when they are older your child will almost certainly carry around in their pocket their mobile telephone that will give them access to more information than we could possibly hope to teach them. We hold dear our values because we believe that an independent learner knows where to look for information, a creative one knows how to use that information to solve any problems and a respectful learner knows how to live with others in our world; understanding and celebrating the diversity that we all have to offer. Our team of creative and passionate staff work together to strive for the very best for your child. They plan play based, authentic, purposeful experiences that enable children to rehearse in real life contexts. They inspire our children so that they become immersed in the topic and enthused about their learning. At BFS we believe in nurturing each child to become the best version of themselves that they can be and we are all unique. Our Values are at the heart of everything we do—they are our beliefs and without these ‘tools’ we would not be able to grow anything. In partnership with you, we want your child the grow characteristics of; Leadership, Integrity, Curiosity, Responsibility, Pride and Aspiration. In order to support the growth, we put in a framework of learning experiences. This trellis supports the growth. Our mission is that with these characteristics your child will be able to succeed in whatever path they choose in life. 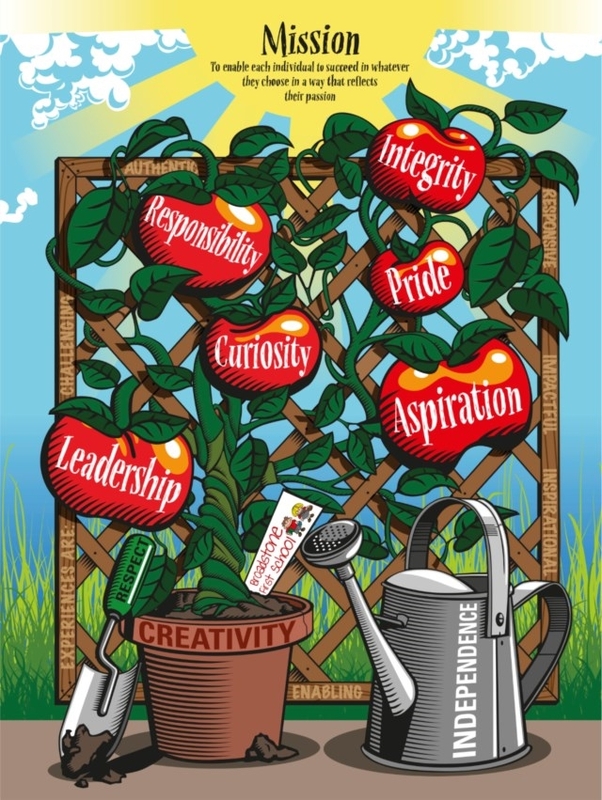 In order to support character growth, the school is split into six Gardens, each with children from Reception to Yr4. We work in Garden groups occasionally over the course of the year where it is a natural way for our learners to take care of others in their Garden and work together to earn rewards! We recognise the importance of the home learning environment as over 70% of children’s lives are spent, not in an educational setting, but with their family and the wider community. You have the right to play a central role in your child’s education and we strive to build strong partnerships with all parents. If you do choose to entrust your child’s education to us, we want you to feel confident to contribute to decisions that are made about them. We firmly believe that successful relationships between parents and educators can have long-lasting and beneficial effects on children’s learning and well-being and that two-way communication between home and school is essential if we are to maintain and develop our partnership with you. We actively seek to work with parents and carers to ensure that your child is prepared for life in an ever changing world. If you wish to see our values in action, please feel free to book an appointment to come and experience our unique learning community.